My plans to bury a Doughboy Intrigue fell thru. The installer decided he did not want to do it. Because of my homeowners association my pool has to be inground. I found a Radiant dealer and installer willing to do a full inground install. My ground is mostly clay, the Radiant dealer is saying I can use almost anything to back fill with and there is no specific requirement that would void my warranty. My excavator is recommending a sand-cement slurry similar to what Doughboy recommends. My dealer is saying that is not necessary and anything that packs solid is fine. What do you think the best back fill would be for this type of install? Hi Tony. I have to agree with your dealer that anything that packs solid is fine. Be sure the pool is completely full of water before backfilling. The filter should be hooked up and working and the entire package checked over for leaks. 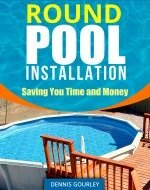 Once the pool is backfilled you do not want to drain the pool for at least a year. That's about how long it will take the ground to pack enough to allow the pool to be drained. Draining before that time could easily cause a cave in. Be sure to leave enough pool out of the ground so that the water is always higher than the dirt on the outside of the pool. I like to see at least a foot out of the ground. When you do need to do a liner change, do it fast. Drain, change liner and refill as quick as possible. This page may be useful to you also. What about decomposed granite, would that be better than just the dirt they take out of the hole? Hi Tony, decomposed granite would be an excellent option. It sure does pack solid.